Experimenting with Software Defined Networks (SDN) on real hardware has become a lot easier since I discovered the Zodiac FX switch from Northbound Networks. This 4-port switch supports Openflow v1.0 and v1.3, and it supports many Openflow controllers. 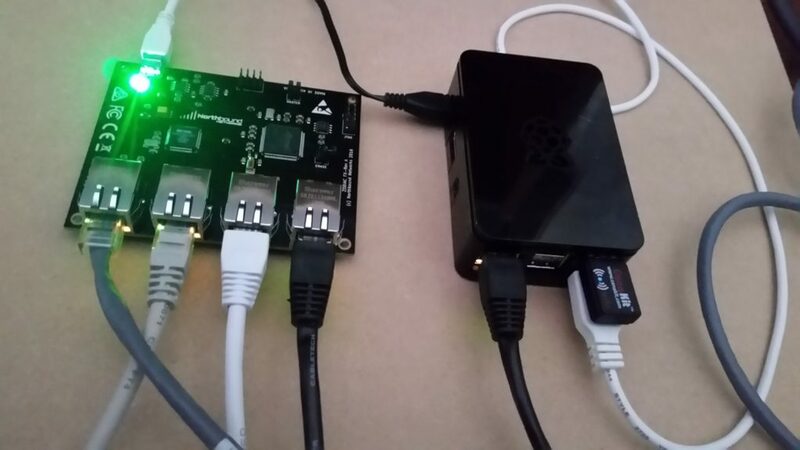 This post describes the process of connecting the Zodiac FX switch with a Raspberry Pi, which runs an Openflow controller and SDN applications. This setup is intended for SDN-related research or training. But my goal here is to start the first step towards building a software defined home network. I chose the Faucet controller for this implementation. This controller has been featured recently as a solution suitable for deployments in enterprise networks. This first phase of the implementation is a replication of the original post by Josh Bailey at https://faucet-sdn.blogspot.ca/2016/06/raucet-raspberry-pi-faucet-controlling.html. If you want to replicate this implementation, you should note that I connect to the RP using Wi-Fi to free up the Ethernet port for switch connectivity, and I use Putty as a SSH client. It is also possible to connect to the RP directly using a keyboard and monitor. I use pico to edit various files; you can use any editor you prefer. I also assume that you will install any missing software and tools that you need on the RP as you follow this post. The links will give you all the details you need. We begin by connecting the Raspberry Pi to the Zodiac FX switch. The RP will supply power to the ZFX via the USB cable included with the ZFX. Connect an Ethernet cable between the RP and port 4 on the ZFX. Plug the supplied USB cable into the ZFX and the RP. Then power up the RP. The switch should not have any other connections. The ZFX will appear in Debian as the serial device /dev/ttyACM. The Ryu Controller is an open software-defined networking (SDN) Controller. For an introduction to Ryu and quick installation guide, visit this site and this. The following worked for my Raspberry Pi 2. Connect two IP devices to ports 1 and 2 in the ZFX switch and configure their IP addresses to be on the same subnet. They should be able to ping each other. This implementation is a replication of the original post by Josh Bailey at https://faucet-sdn.blogspot.ca/2016/06/raucet-raspberry-pi-faucet-controlling.html. Some details are changed or added. At this point the two devices connected to ZFX should be able to ping each other and if you log into ZFX, the status of Openflow should look like this (notice the Openflow version is changed to v1.3). At this point your ZFX will work as regular Layer 2 switch. I used mine to replace one of the switches at home. More about this later.